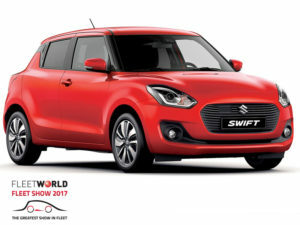 With its sights set on doubling its sales to business users, Suzuki will mark its Fleet Show debut with the chance to try its entire product range, including the all-new Swift supermini. New Suzuki Swift supermini will be available to test drive at Fleet Show 2017. Formally launching to the corporate market in June, the Swift will be one of six models available at the Silverstone event, alongside the Celerio city car, the Ignis compact crossover, the Baleno hatchback, the Vitara compact SUV and the flagship S-Cross crossover. It launches following expansion of Suzuki GB’s central fleet team, as it aims to grow its corporate sales from 5,000 in 2016 to around 7,500 this year. Its ultimate goal is to reach 10,000 fleet sales per annum as the brand as a whole aims to hit 50,000 registrations in the UK. Head of fleet Graeme Jenkins said: “For the first time in our history we’ve got four or five vehicles suitable for fleet; whether that’s the new Ignis, which will have appeal in the public sector, the new Swift which arrives in June, S-Cross and Vitara, or Baleno. All of those cars, in their own right, give us a lot of opportunity in segments Suzuki perhaps hasn’t tackled previously. “We have gone through a long process of deciding the right way to go to market to increase volumes, and we are investing heavily in getting the infrastructure right for the fleet team to go to market and help them reach the goals we want to achieve. A Suzuki fleet spokesman added: “The Fleet Show is a unique platform to reach out to hundreds of potential customers and influencers in one location who will be able to get behind the wheel of our models and experience first-hand the great value that we offer. We look forward to welcoming them to the brand, and discussing any specific requirements that they may have.”Experience the latest cars and vans, meet the industry’s biggest suppliers, network and attend a packed seminar session at the Fleet Show, held at Silverstone. Secure your place by registering at www.thefleetshow.co.uk.